we can clone the Github repo to our project folder. Assuming that you have composer installed, ( check installation guide for more details). we run composer create-project laravel/laravel laravel_membership --prefer-dist, this will create a laravel boilerplate project in our laravel_membership folder. Now we need to require the Laravel Cashier package to the project by adding "laravel/cashier": "~1.0" to our composer.json on the require section and run composer update to update our dependencies. After that we need to tell our app to load the Cashier service provider class. We can do that by adding "Laravel\Cashier\CashierServiceProvider" to the providers array on the config/app.php file. Note: You must run composer dump-autoload to update the classMap package. If you are new to Laravel Migrations be sure to check the documentation. The Laravel artisan command line tool makes it easy to create and manage migration classes. php artisan migrate:make create_users_table --create="users"
To let Laravel Cashier know about our billable table we need to create a specific migration for that. Laravel Cashier has a built in command for that purpose. if you open your users table you will see a bunch of fields added when the package migration is executed. – stripe_active if you have an active subscription. – stripe_id user id on Stripe server. – stripe_plan Stripe subscription plan. – last_four credit card last four digits. – trial_ends_at an end date is stored if you specify a trial period. – subscription_ends_at subscription end date. Now we will seed the database with some dummy data to get started; check the final result on GitHub. Dealing with payment can be a pain in the neck, and Stripe can help you with that, they use tokens instead of card numbers etc.., and that’s how you can make sure that your customers stay secure while paying for your service. NOTE: Check if Stripe is supported in your country, but you can still use it for testing if not. To get started we need to get an account first. 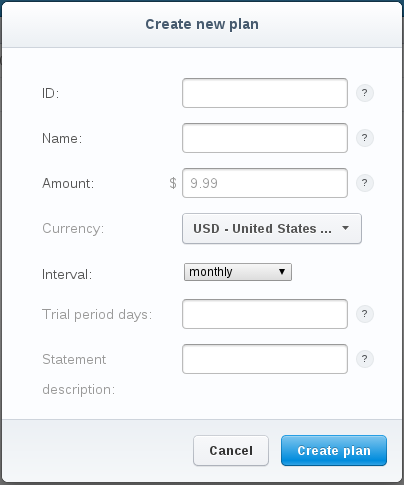 Stripe doesn’t have a monthly fee for the subscription, you only pay when you get paid. Now, after getting an account you need to create Plans for your application (Monthly, Yearly, Silver, Gold…). Every field is self explanatory, so lets create a Gold membership that will cost $40 and a Basic membership for $10. They will be billed every month. We have already added the necessary columns to our users table, now we need to let Laravel Cashier know that we will use the User class as our billing class. Note: we’re using BillableTrait and traits require PHP 5.4 or greater. 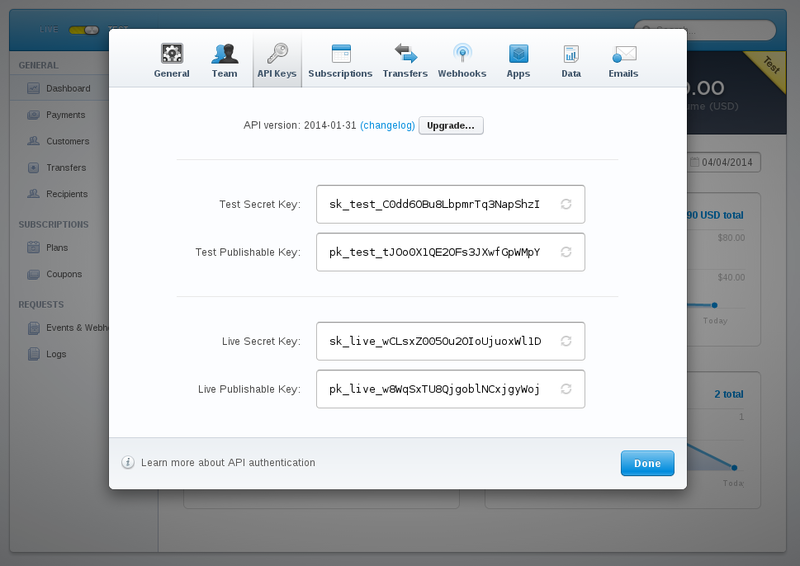 Now we have to set our Stripe API access key, which you can get from Your account > Account settings > API Keys and copy your Test Secret Key. When getStripeKey tries to load your key it will look for a property called stripeKey. If not found, it will automatically load your services file. 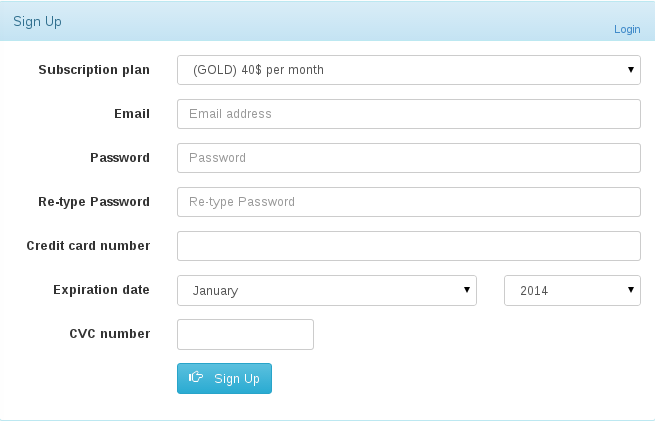 – Signup: where user can signup with a membership plan ( Basic, Gold ). – Login: members login page. 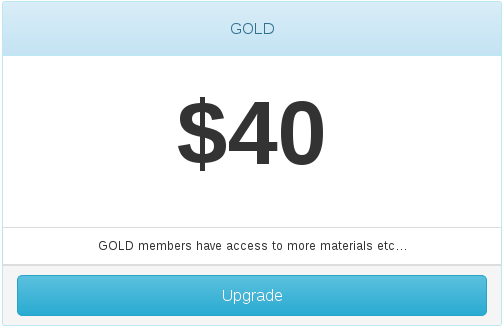 – Upgrade: upgrade from basic to gold membership. – Post: display a single post page. To speed up the process we will use bootsnipp. You can get the final code from the GitHub repo. 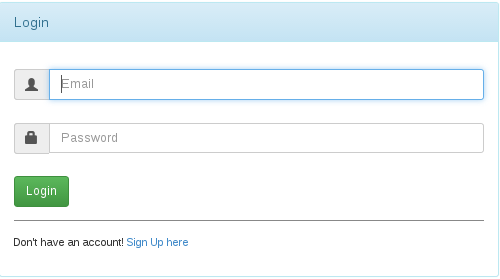 The signup page has a Subscription plan field used to assign a user to plan. We have also a Credit card number, Expiration date, CVC. As we said earlier, we will never have to deal with any payment or verification process, we pass those values to the Stripe server to take care of the charging and verification process. The return value is a token in case of success otherwise we get an error message that we can show to the user. Next we attach a callback function to our submit form (be sure that your form ID matches the one used on the event handler), to prevent a double submission we disable our submit button. The Stripe.card.createToken accepts two arguments, the first one is a JSON object that has some required and optional values. number: card number as a string without any separators. exp_month: two digit number representing the card’s expiration month. exp_year: two or four digit number representing the card’s expiration year. cvc: card security code as a string, the cvc number is optional but recommended to help prevent fraud. address_line1: billing address line 1.
address_line2: billing address line 2.
address_zip: billing zip as a string. The second argument passed to Stripe.card.createToken method is a callback function to handle the response. In case of failure the stripeResponseHandler will try to find an element with a class of payment_errors to display some descriptive errors to the user. In case of success a stripeToken hidden input will be appended to the form and it will be available on submit. Trial periods: as we stated before, when you create a new plan you have a choice to specify a trial period for users to test your product, and they won’t be charged until the specified period has elapsed. Coupons: you create coupons via your dashboard menu where you can specify a fixed amount or by percentage,with some other useful options. Now let’s move to our SignupController to see how we will handle this. We will skip the validation process to keep things simple. After creating a new User and saving it, we now have the option to subscribe the user to a new membership plan. The subscription method accepts an already registered plan as an argument, that can be either a PlanInterface or a String and return a StripeGateway. The create method accepts a token as a parameter; we pass the new hidden input value with the name stripeToken. We check if the user is logged in first, then we create a new subscription with the new plan and we call the swap method, obviously in a real project you will have some fees adjustments and a downgrade option, but it should work the same way. The PostController checks if the post is_premium, and if so, we test if the user is a gold member who can see the post, else we return a simple error message. Of course in our routes.php file we need to add an auth filter to prevent unauthenticated users from accessing the page. onPlan: see if a user is on a certain plan. onTrial: see if a user still on trial period. canceled: if the user has canceled their subscription. getLastFourCardDigits: get the user card last four digits. getSubscriptionEndDate: get the subscription end date. getTrialEndDate: get the trial end date. invoices: get the list of user invoices. findInvoice: find an invoice by id. downloadInvoice: generate a downloadable invoice by id. In this tutorial we explored how Laravel Cashier can ease the billing process and help manage your customers more easily. We certainly didn’t cover everything here, but it’s a start for you to dig into the source code to explore what else you can do. If you’d like to see a Nitrous-hosted demo of this app, see here.